Welcome to the Chicago & North Western #1385 steam status blog! Follow along as we bring the 1907 American Locomotive Company 4-6-0 steam engine back to operating condition. 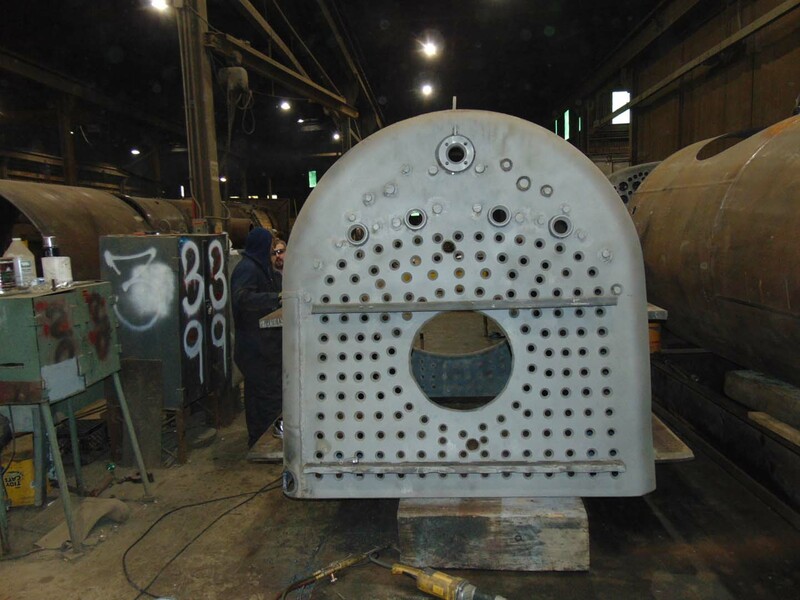 Tom G. of Continental Fabricators kindly supplied Mid-Continent Railway Museum with this photo of C&NW 1385’s boiler. 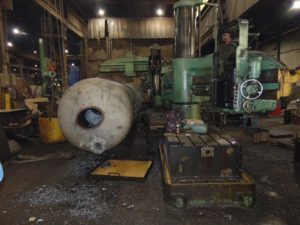 The photo was taken on April 17, 2019, and shows the boiler barrel in position as it is readied to be joined to the firebox. 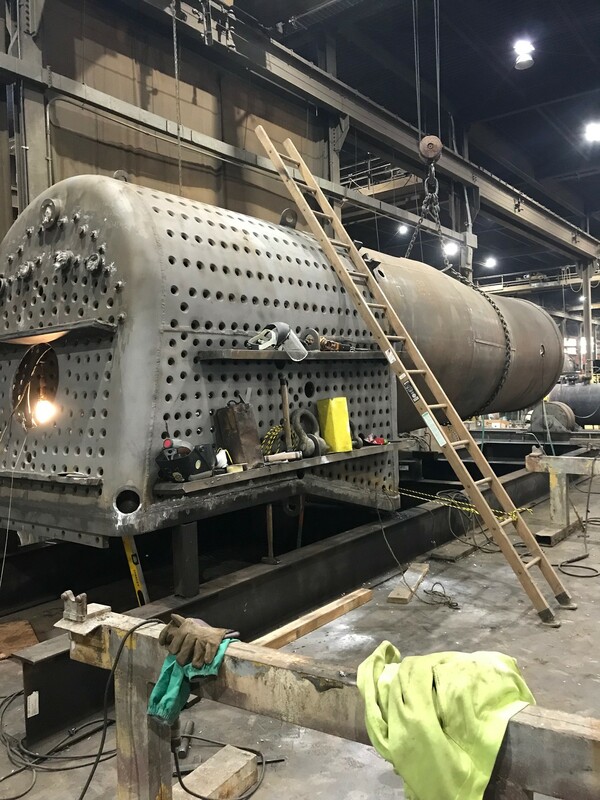 Work on the boiler is taking place at the Continental Fabricator’s shop in St. Louis, Missouri. 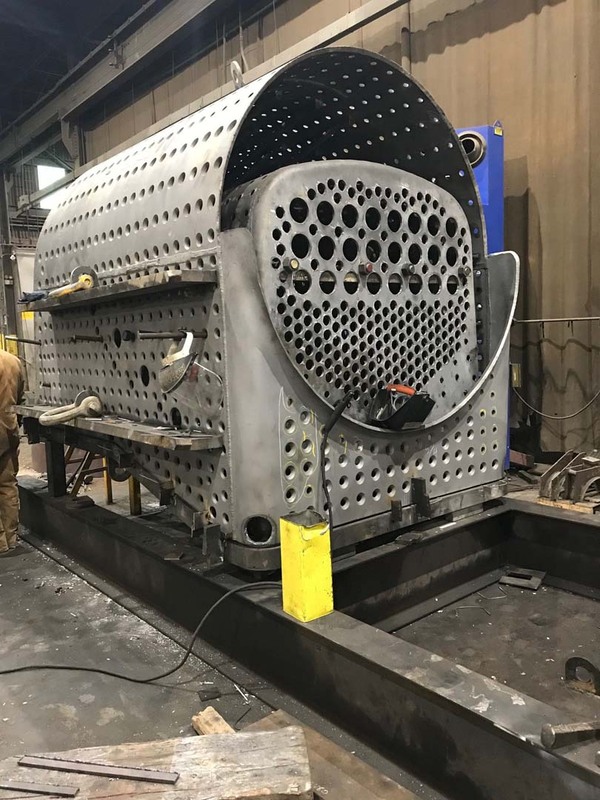 When completed, the boiler will be delivered to Wisconsin and be set on the C&NW 1385’s overhauled frame. Our previous post provided a tour of the Continental Fabricators facility where the brand new boiler C&NW #1385 boiler is being constructed. 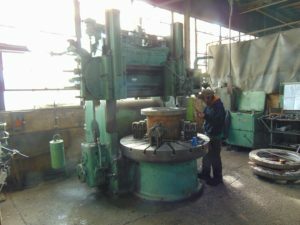 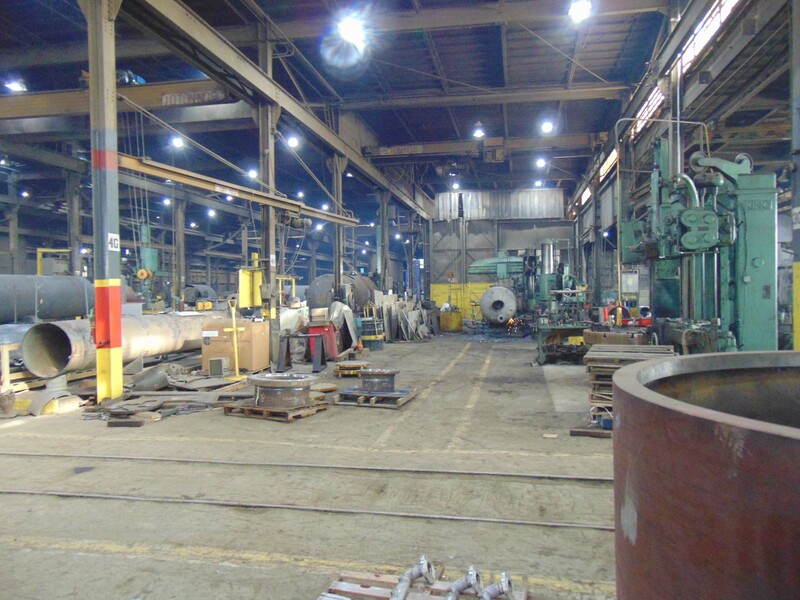 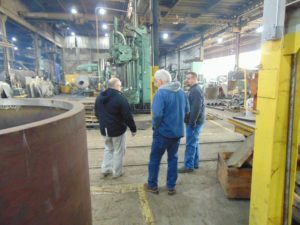 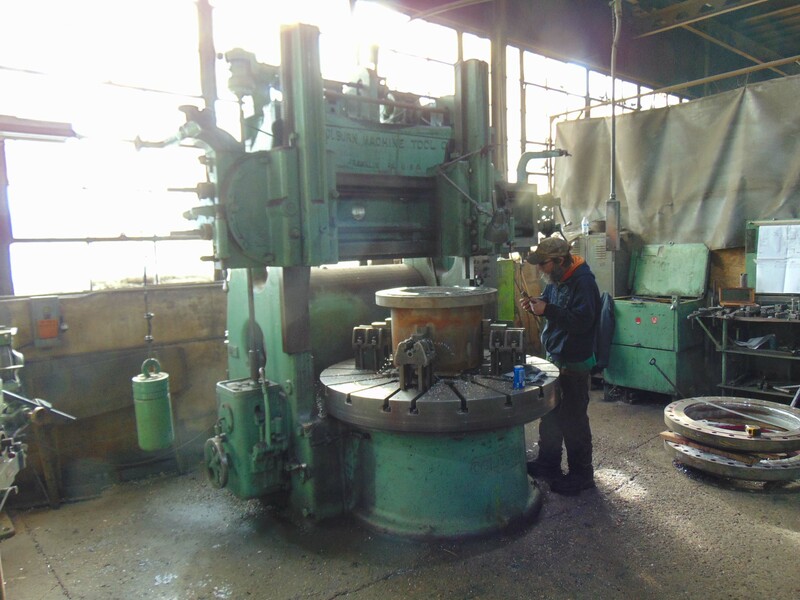 In this post, 1385 Task Force member Pete Deets shares his photos taken of the 1385 boiler during their shop tour in late February. 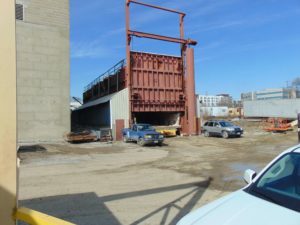 At the end of the previous post, I thought I spied something familiar. 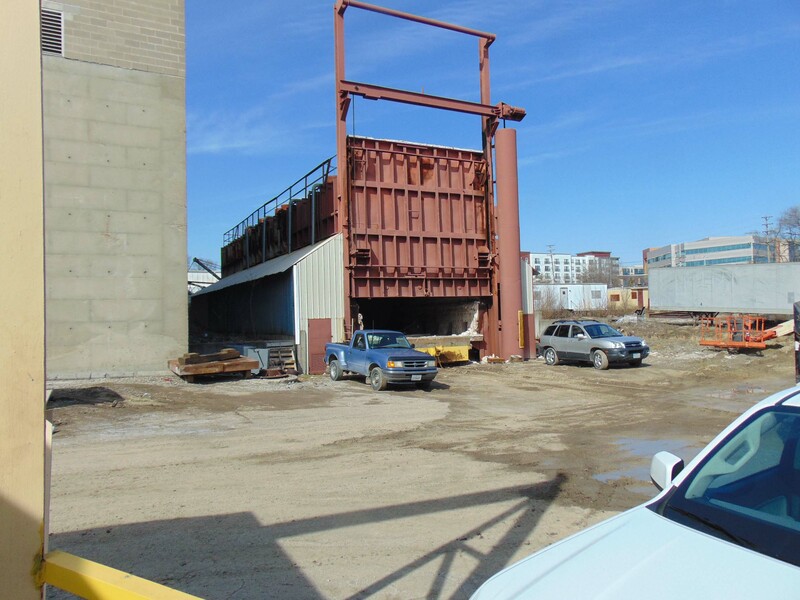 Could it be our own beloved R-1 in the distance? 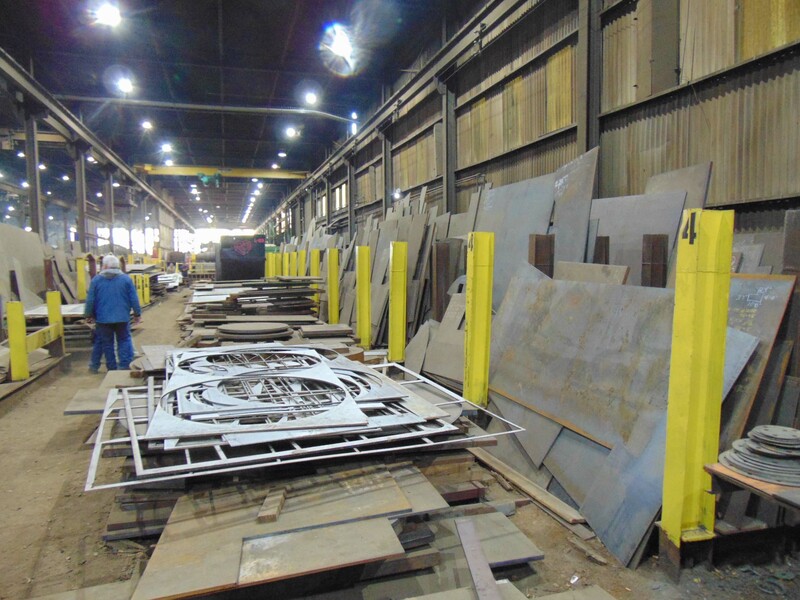 Indeed, here are the pieces of the new vessel. 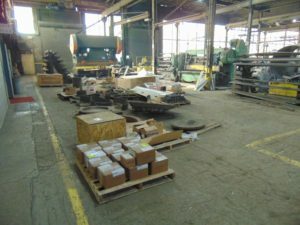 This is actually an assembly table embedded in the shop floor which gives the boilermakers a stable, flat surface to work from. 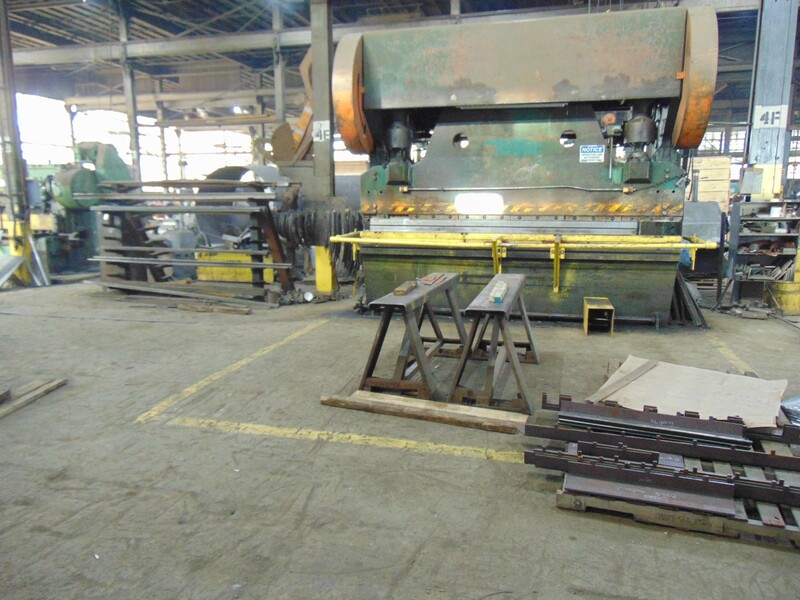 The mudring/firebox assembly is mounted to standoffs on the I beams and is set up to be level and square. 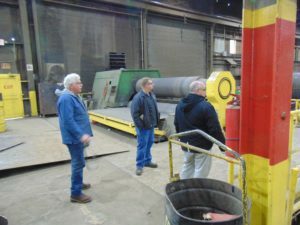 With the foundation ring level and square the rest of the boiler assembly can be indexed off that so there won’t be twists and turns where we don’t want them. 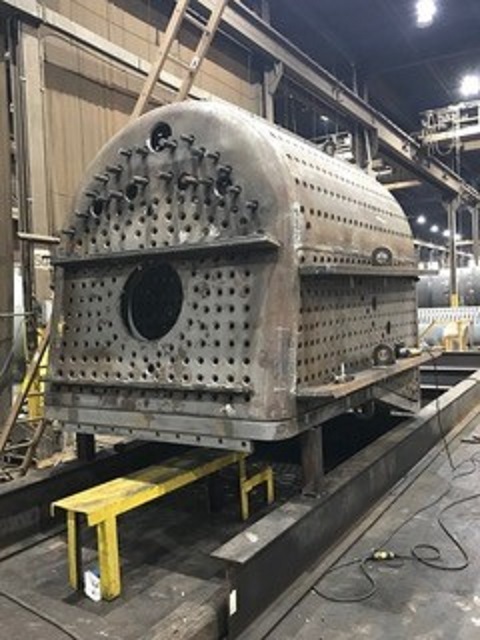 The boiler barrel courses/smokebox assembly is on the I beams ahead of the firebox. 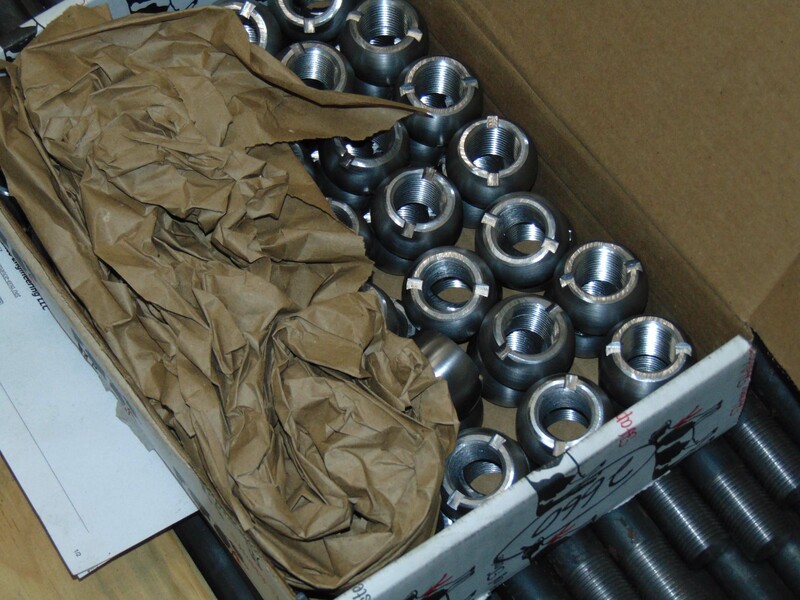 In the photo above Tyler R. of SPEC Machine inspects the wrapper assembly. In the photo below Tyler and Steve R. talk over the boiler with Tom G. of Continental. From the other side of the assembly table we’re looking into the smokebox at the front tubesheet with the firebox assembly setting beside it. 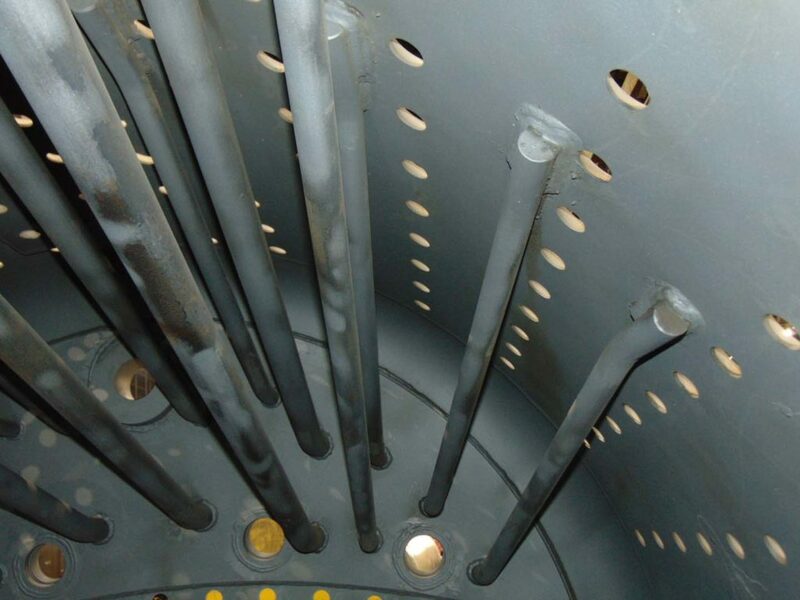 The small holes are 2-inch diameter for the tubes and the larger holes are 5 inches for the superheater flues. 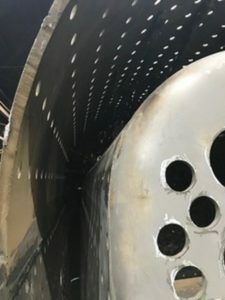 The largest hole is for the dry pipe which will carry the steam from the throttle inside the steam dome of the boiler into the superheater header which lives in the smokebox. 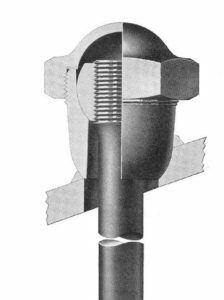 After traveling through the superheater units the steam will leave the high temperature side of the superheater header and head down the branch pipes to the valves and cylinders to make everything move. 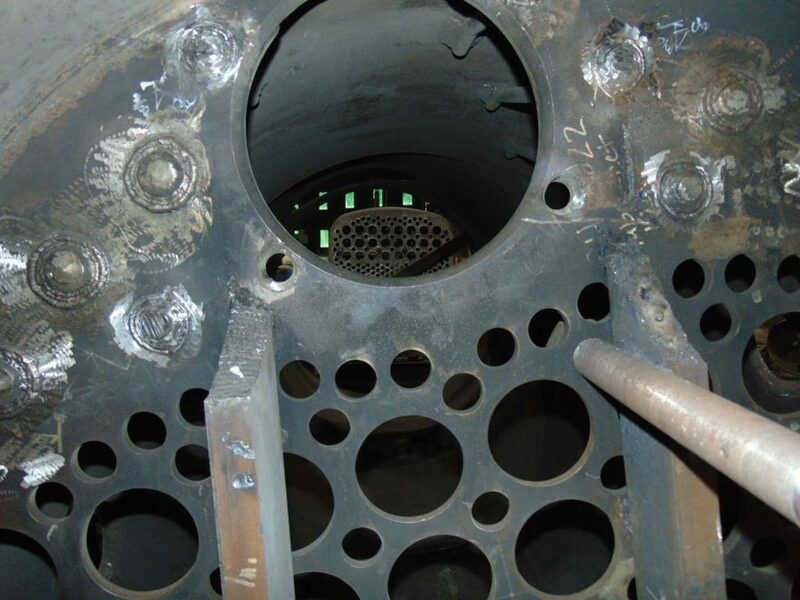 The above picture is looking through the dry pipe hole at the rear tubesheet on the firebox assembly. 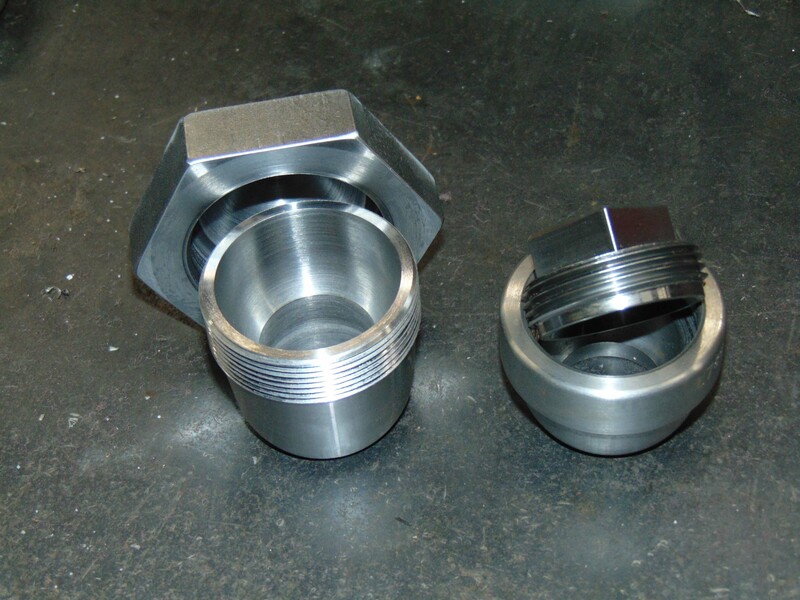 It won’t be too long before these are joined together. 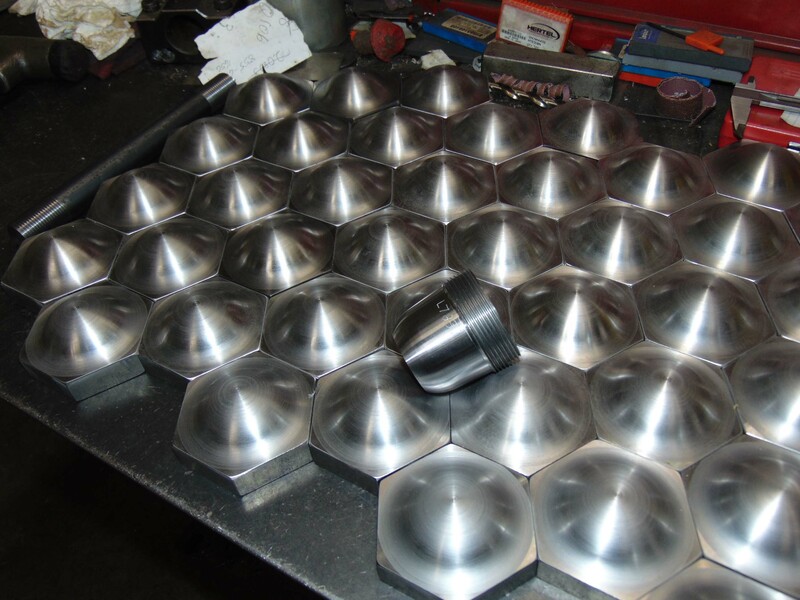 Here is a good look at the backhead portion of the wrapper assembly. 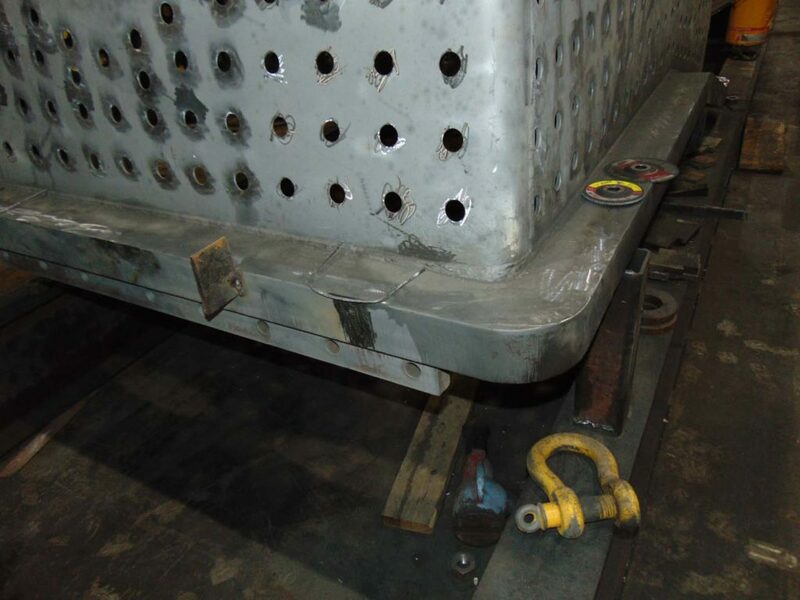 You can see temporary “strongback” braces that are welded on here as on many of the other parts. 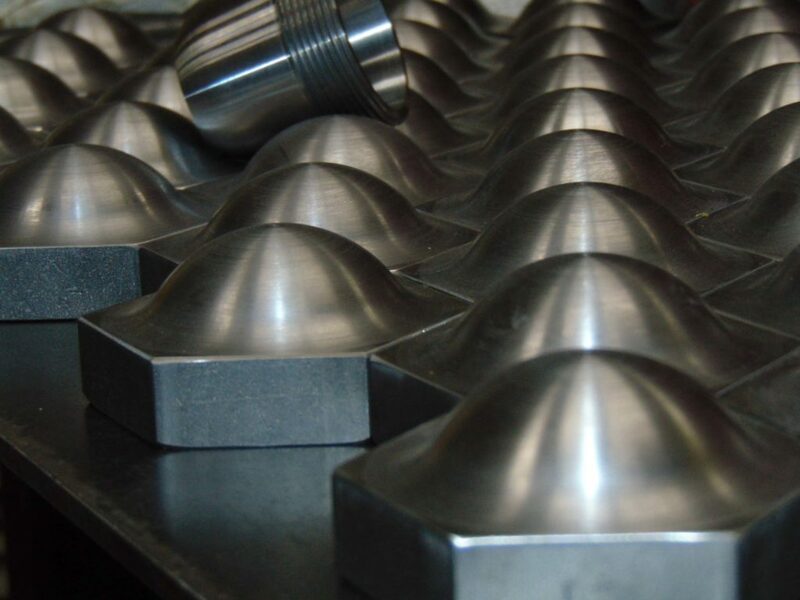 These are to minimize warping from the heat of the welding process and are used to keep flat sheets flat and round pieces round. 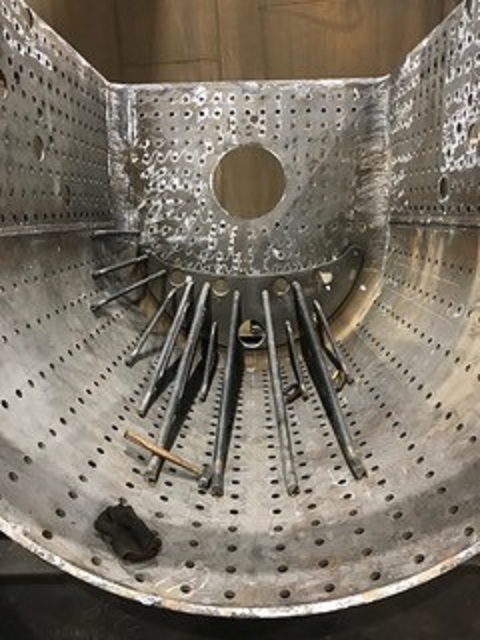 This is a look inside the wrapper assembly at the permanent braces that are attached between the wrapper shell and the backhead. The Continental staff spent several weeks laying out and fitting the braces because there will be staybolts installed in every one of the small holes in the wrapper. 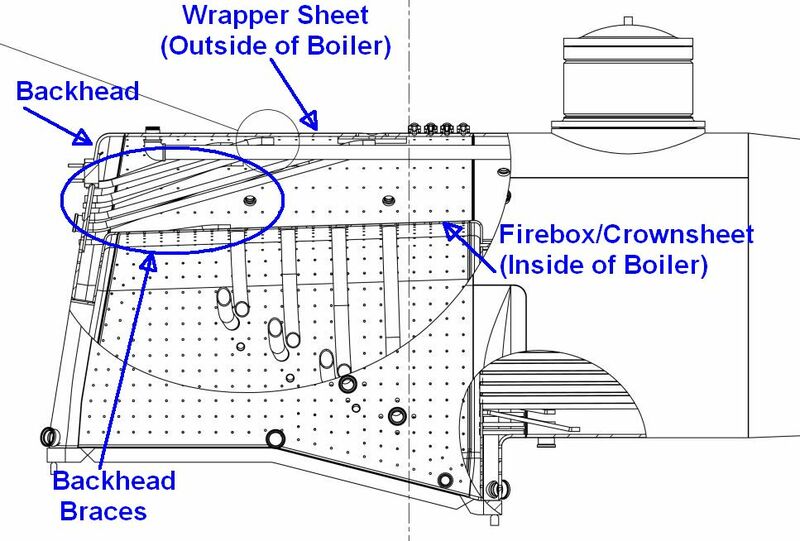 The stays will tie the firebox and wrapper sheet together as the steam inside tries to push them apart. There must be a specified clearance or space between the braces and staybolts so they can’t rub. 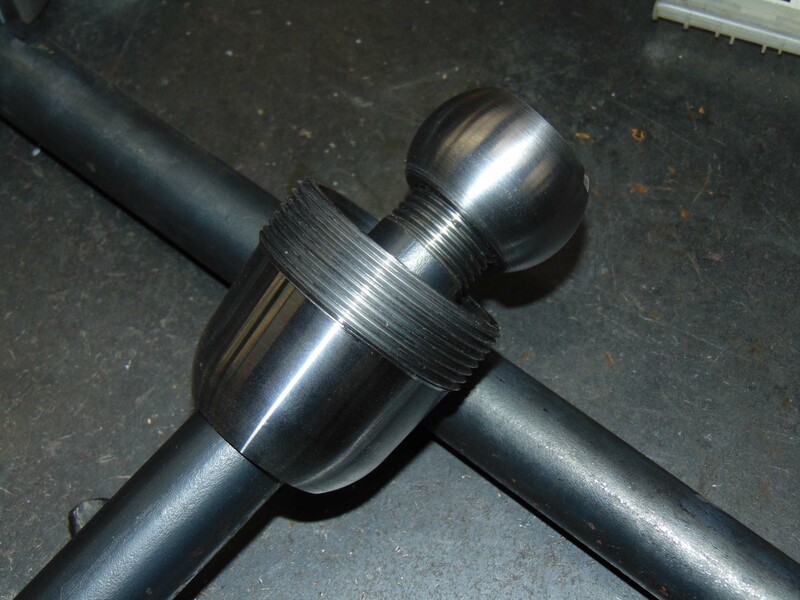 Here is a closer look at a pair of stays that required a slight bit of adjustment. 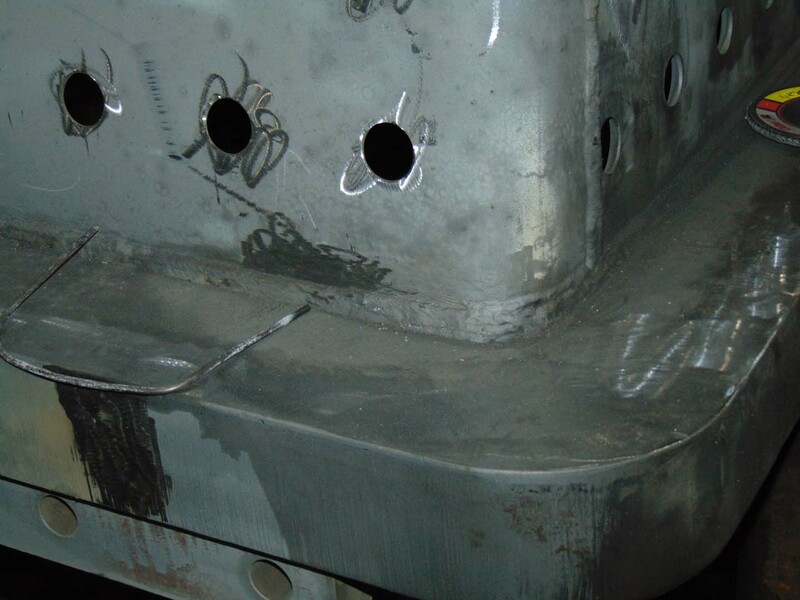 This is a look at one corner of the mudring/firebox. The tab at the left of the photo is tacked in place to help locate the wrapper as it is lowered onto the mudring. 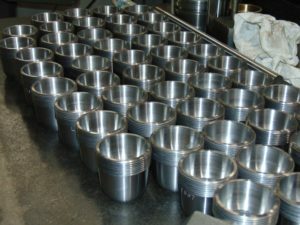 The U-shaped pieces of wire will be used as spacers between the wrapper and mudring to maintain the required gap between them as part of the full penetration welding process. 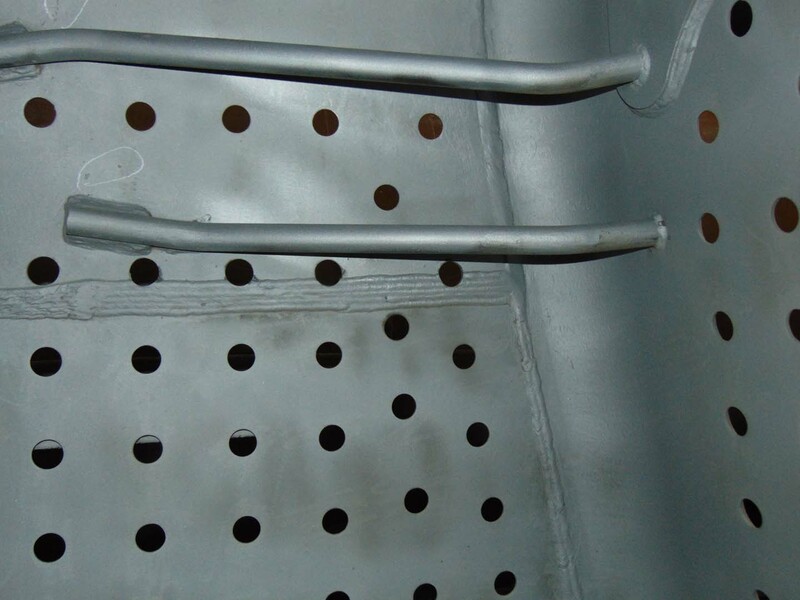 The written welding procedure states a specified gap must be maintained between the parts and that gap is filled with the welding rod in what is called the “root pass” of the weld. 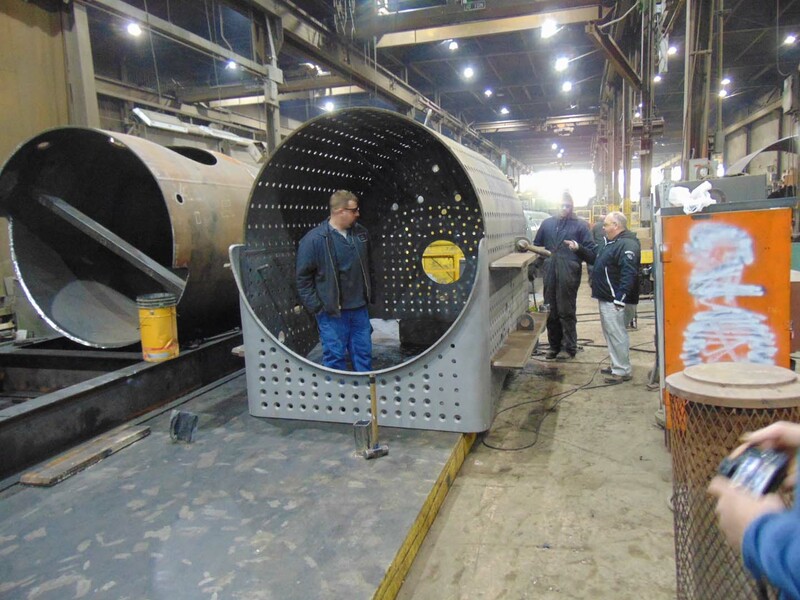 The wrapper will first be tacked into place with several small welds and the spacers will then be removed to allow the procedure to continue. 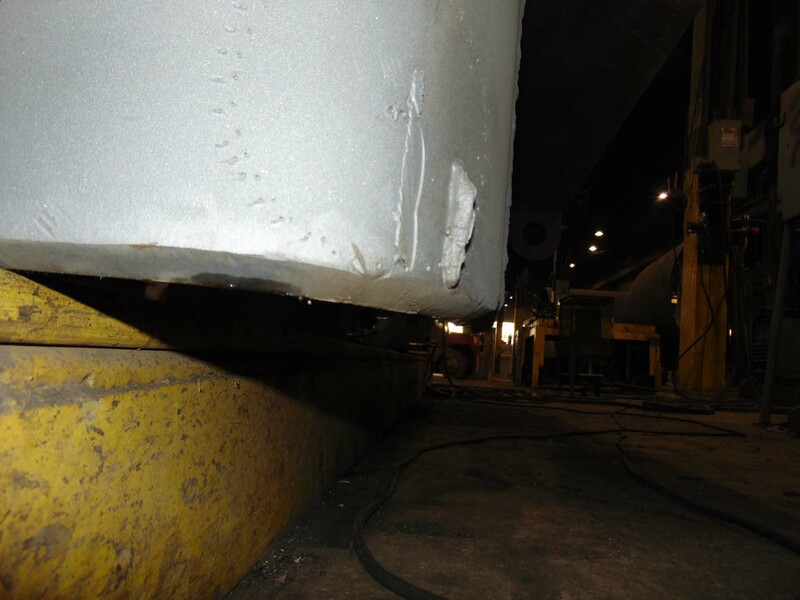 Here is a little closer look at the finished full penetration weld joining the firebox to the mudring. This is the bottom of the wrapper assembly where it will be welded to the mudring. The edge is ground off at an angle or beveled to allow the welder to reach to the very inside edge of where the wrapper and mudring will meet. 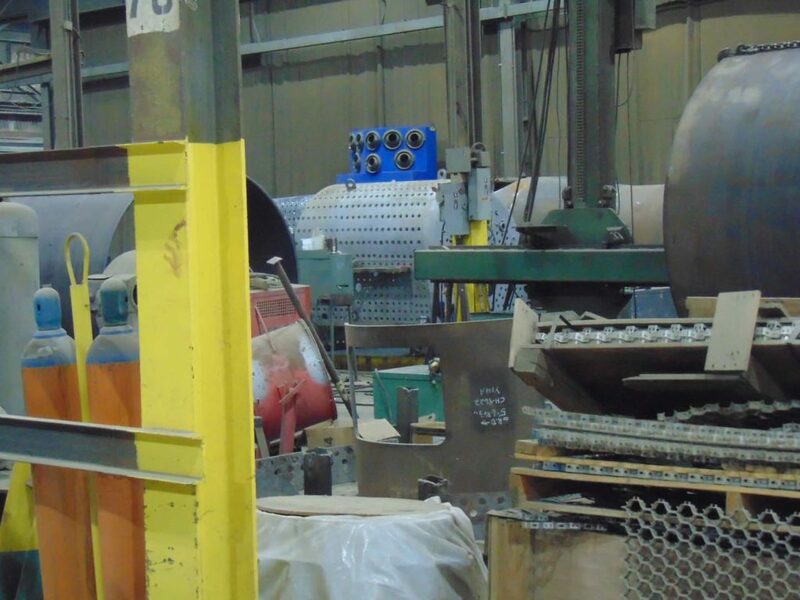 This is vital to allow the “root pass” to join the innermost surfaces of the wrapper to the mudring and then layers of weld will be built up on top of the root to the full thickness of the wrapper sheet. 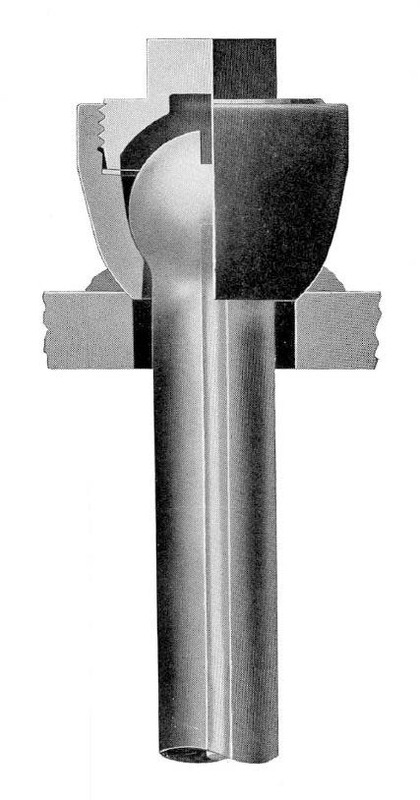 This way the joint between the pieces can be considered as strong as the pieces that are joined together. 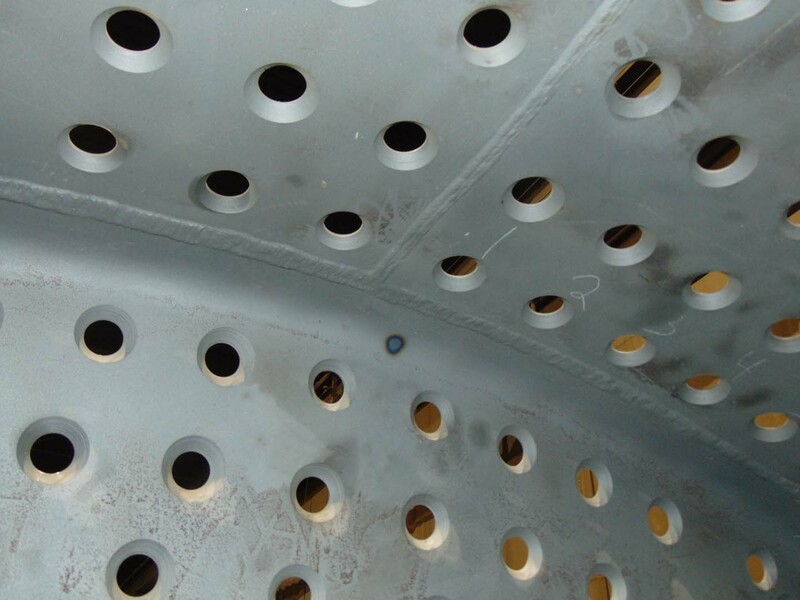 This is looking up at the center rear of the top of the inside of the firebox. 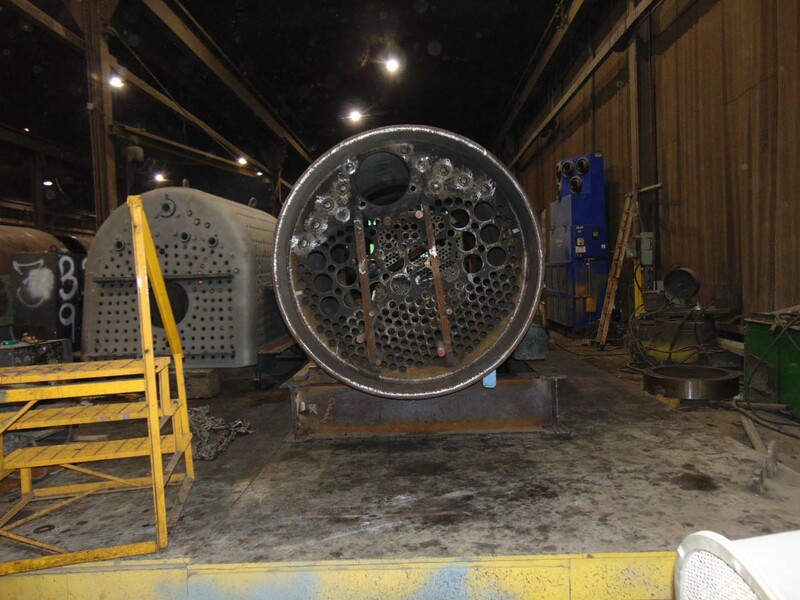 The 2 pieces of the firebox join the door sheet and the weld line runs down the centerline of the boiler. 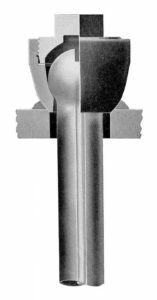 You can also see how the staybolt holes are beveled like the bottom of the wrapper was to allow for the full penetration weld. 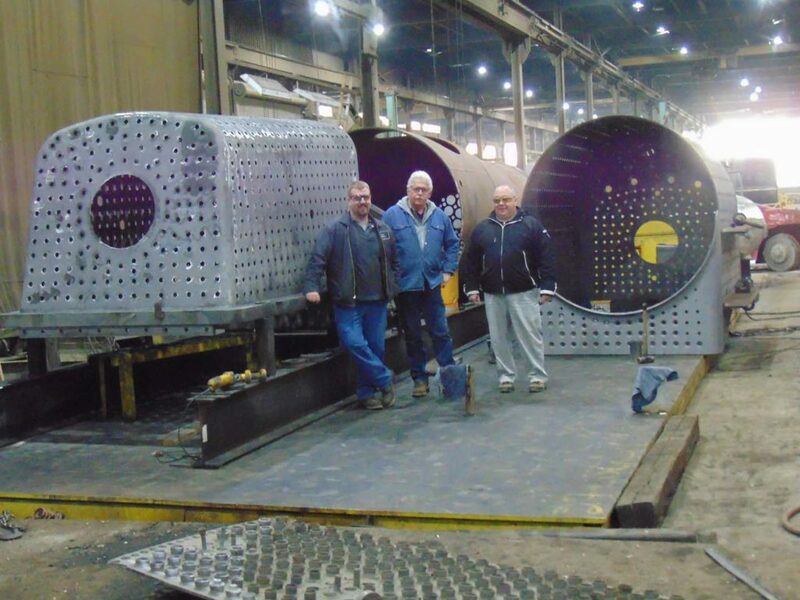 Here’s one last shot of Tyler, Steve & Tom. A few days after the visit, Tom from Continental Fabricator’s sent over a photo he took on March 4th showing further progress on the firebox/wrapper assembly. 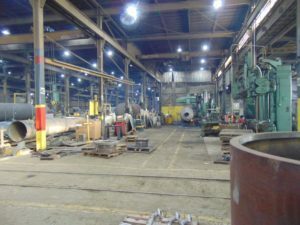 Continental Fabricators was recently highlighted in Business & Industry Connection magazine. In discussing current projects at Continental, boiler fabrication for US Sugar #148 and Mid-Continent’s own C&NW #1385 were highlighted as the type of specialty projects Continental is capable of tackling. You can check out the digital edition of the magazine, which includes a photo of 1385’s boiler. 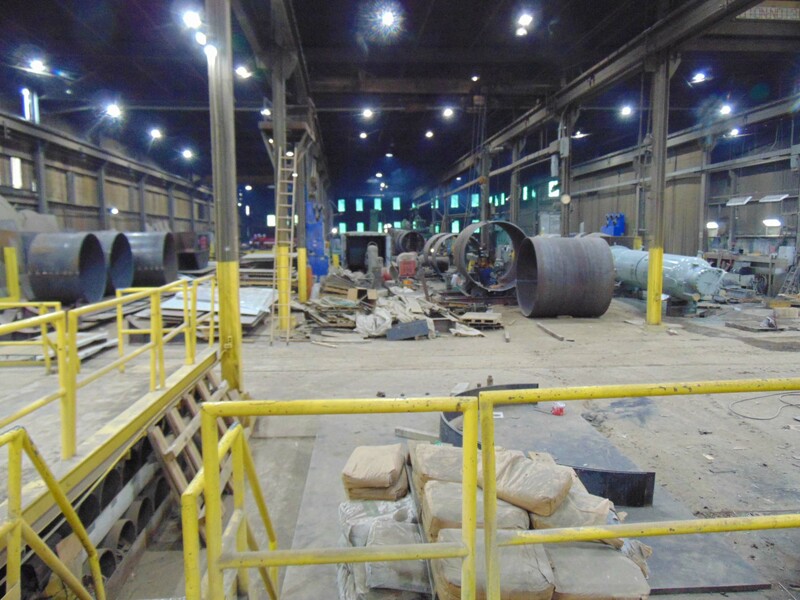 BIC Magazine’s circulation includes industry managers and executives in the refining/petrochemical, drilling, pipeline, marine, terminal, pulp and paper, power generation and heavy construction industries.